The Pinoy Informer: Trainspotters - Who are They? Trainspotters - Who are They? The Metro Rail Transit (MRT), Light Rail Transit (LRT) and the Philippine National Railway Corporation (PNRC) are the three train companies that are operating in the Philippines. I already rode the trains of MRT and LRT. I am yet to ride the train of PNRC and I want to experience riding on PNRC's sleeper coach on a travel from Manila to Bicolandia. 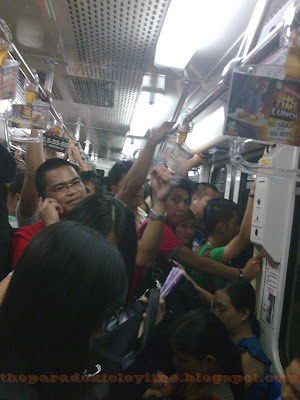 The photo above shows what is inside a MRT coach during rush hours. It is crowded and you will be crushed if you stand near the train doors. Riding a train is just normal experience and I never thought that there are groups of people who enjoyed seeing, photographing and reading about railways and trains. These people are usually called as trainspotters. According to Wikipedia, trainspotters are different from railfans though both of them are interested on trains and other things related to the operation of the railway network. Trainspotters are people who aims to “spot” (hence the name trainspotters) trains or any type of rolling stocks depending on the interest of the trainspotter. Some trainspotters spot trains of particular type, or of particular railway company, etc. Trainspotters, for me, have a unique kind of hobby and only few people have such kind of hobby. I am yet to meet a Filipino trainspotter. However, I had a friend in Facebook who is part of a society of railfans and are interested with the railway system of the Philippines. Visit Before the Eastern Sunset and read about the story of Saint Augustine regarding the Holy Trinity.